Already own the book? Get a special free bonus! It's the goal of every salesperson. Getting access to senior client executives - the C-Level decision makers responsible for approving top-dollar deals. Selling to the C-Suite is the first book that reveals how to land those career-making sales in the words of CEOs themselves! The authors couldn't find any books written on this topic that held anything more than personal anecdotes of what the writers of those books did in their glory days as a salesperson. So they commissioned groundbreaking research of their own, and joined other projects where executive buying habits were the focus of study. After ten years of asking CXO-level executives about their relationships with professional salespeople, this book now reveals what C-Suite leaders in 500 diverse companies and government bodies said in response to those interviews and surveys. One thing they learned might surprise you: Leaders at the highest corporate levels don't always avoid sales pitches; in fact, they welcome them - provided the salesperson approaches them the right way. Inside this invaluable book, these CEOs reveal which sales techniques they react best to, as well as those that you should avoid. 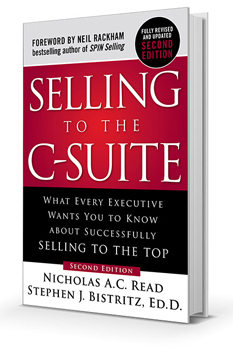 The first edition of Selling to the C-Suite became an instant classic and has already had a major impact on the sales profession. Now fully revised and updated, the 2nd edition of the book explains how the impact of online tools and social media are revolutionizing the way executives buy, and how you can successfully sell to them. In addition, one of the key concepts fully expanded in this edition of the book is the concept of the relevant executive for the sales opportunity. The relevant client executive is defined as the executive who stands to gain the most or lose the most as a result of the application or project associated with the sales opportunity. The need to align with the relevant executive is another of the key concepts disclosed. The book also explores what senior executives said about their relationships with professional salespeople, including how salespeople should align with the relevant executive to win those critical key deals. Many of the concepts and models in the book have already been field-tested in the SellXL workshop that was developed several years in advance of the book. In fact, many of the graphics within the book were extracted from that workshop.